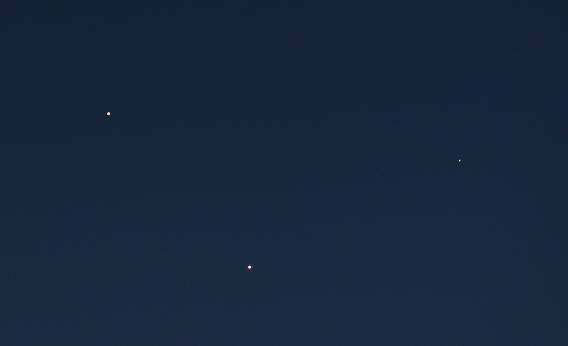 If somebody tells you they saw a pair of UFOs this week, ask them to be sure they weren’t just gazing at Venus and Jupiter. The two planets have been moving toward one another in the night sky for months now, and star gazers get a special treat this week as they line up for a planetary conjunction. Venus and Jupiter get cozy about every 13 months, but this particular tango of the sky’s two brightest planets is special because they’ll be extra visible during the long evening in the Northern Hemisphere—and that won’t happen for another several years. By the time it peaks this Thursday night, the planetary conjunction will be visible above the western horizon for four hours. Venus, much closer than Jupiter, will be the brighter of the two planets, even though it’s much smaller in size. So take off the tinfoil hat and dust off the telescope; this close encounter of the celestial kind is worth watching.